The Northern Gulf Institute (NGI), a NOAA Cooperative Institute, and its member institutions - Mississippi State University, Dauphin Island Sea Lab, Florida State University, Louisiana State University, and University of Southern Mississippi – hosted 180 regional researchers at their 4th Annual Conference in Mobile, Alabama last month. Included were Gulf of Mexico ecosystem experts who convened to discuss research, response, and planning efforts involved with the Deepwater Horizon incident during the Special Topics Session. NGI's support to NOAA includes providing ocean current forecasts, satellite imagery to responders, and forecasts of oil burn smoke cloud paths as well as collecting baseline water and animal samples and preparing for economic impact assessments. NGI has multi-discipline teams working in critical Gulf Coast habitats from Florida to Texas with vessels, equipment, laboratories, established protocols for at-sea and in-land sampling and assessment, and analysis and modeling capabilities. NGI's Plenary Session speakers highlighted current Gulf Coast research and featured Geoff Scott with the NOAA National Centers for Coastal Ocean Science, Miki Schmidt with the NOAA Coastal Services Center, and Larry McKinney with the Harte Research Institute. Thirty-six technical presentations covered topics of Social Science, Education and Outreach; Nutrients and Habitats; Fisheries; Tools, Observation, and Management; Modeling; and Food Webs. 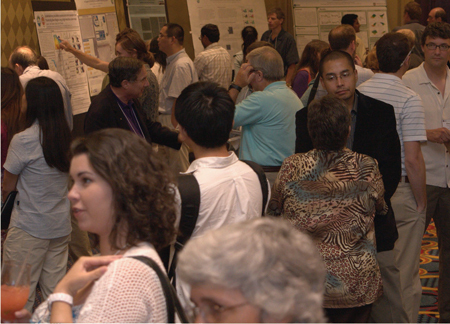 Forty-eight posters featured current Gulf of Mexico research by regional scientists, faculty, and students. A panel of NOAA scientists and administrators shared their experiences with NOAA and discussed career opportunities with graduate and undergraduate students at the NOAA Career Roundtable.